In need of a particular part for your car? Call us on 09 438 1980 and press 1 for parts! We stock parts for your car, workshop and engineering needs. Nick has been with Wrack Auto since August 2015. Nick’s role in the business is all about sales, he comes from an automotive background which included car sales, battery and retail sales to mention but a few. Nick is a family man with a wife and two children. When he is not spending time with his family, he is head down working on his other passion which is buying & restoring cars to the highest standard of presentation before moving on to the next project. Cam started out as a Sign Writer; he became qualified and worked for a number of years in the industry. 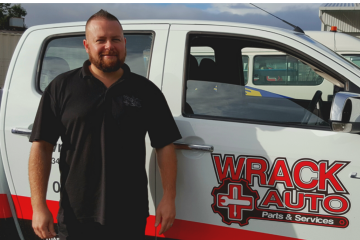 In 2014 Cam joined the Wrack Auto team as a parts consultant where he has now become an experienced and vital member of the team. If you need a new battery for your vehicle, he is the man to talk to! Cam enjoys spending as much time as possible with his twin boys and when able to working on performance cars.